French-Canadian star Jonathan Duhamel has started 2012 off with a bang at Paradise Island’s Atlantis Resort and Casino after breaking through the $10 million barrier in career winnings. The one-time World Series of Poker (WSOP) main event bracelet winner – who was badly beaten when robbers, including former girlfriend Bianca Rojas-Latraverse, entered his Quebec home on December 21 – will certainly be happy to forget about that incident, and has most definitely started this year off in great form. The 2010 WSOP main event champion – which gave him $8,944,310 for his success – cashed in fourth place for $313,600 at the $100,000 buy-in Super High Roller tournament last Saturday at the PokerStars Caribbean Adventure (PCA). Fellow Team PokerStars Pro Viktor ‘Isildur1’ Blom took the top prize of $1,254,400, as well as a massive trophy and a Shamballa bracelet valued at more than $20,000, but Duhamel has now followed up that good finish with victory in the $5,000 buy-in No-Limit 8-Max side event that had a prize pool of $766,300. The 24-year-old from Quebec outlasted 157 other players to pick up the $239,830 top prize after beating fellow Canadian Edward Kim in their heads-up battle. Kim – who finished in 35th for $1,080 at event #2, a $560 buy-in No-Limit Hold’em tournament, of the WSOP Circuit at Harrah’s Atlantic City back in early December of 2008 – left with $134,100 for his runner-up spot. But Duhamel had to face even stiffer opposition at the final table when overcoming players of the calibre of Team PokerStars Pros Pius Heinz – who exited in fifth for $45,980 after the German had won last year’s WSOP main event for $8,715,638 – and American star Jason Mercier. Florida-based Mercier picked up $80,460 for his third place finish, while another American, Keven Stammen left with $57,470 in fourth, and was followed by Heinz, Canada’s Owen Crowe ($38,320) in sixth, London’s Laurence Houghton ($30,650) in seventh and eighth placed Belgian pro Kenny Hallaert ($22,990). 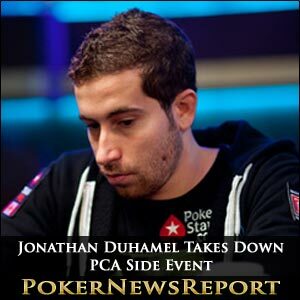 Duhamel, who has now cashed for over $550,000 at this year’s PCA, will surely be aiming to up that healthy return when the $25,000 buy-in High Roller event kicks off later today. It comes as no great surprise that the Canuck secured victory in this side event, though, as he has enjoyed a great series of results since winning the 2010 WSOP main event. He collected $272,209 in January last year for winning the European Poker Tour (EPT) Deauville’s €10,000 buy-in High Roller event, and also came fourth for $125,000 at the $25,000 buy-in No-Limit Hold’em NBC National Heads-Up Championship in Las Vegas two months later. Duhamel also finished in sixth place for $58,000 in the $10,000 buy-in Bounty Shootout at the Big Event in Los Angeles – also in March – was sixth again for $26,883 at EPT London’s £2,000 buy-in No-Limit Hold’em side event in October, and also left with $30,100 for seventh place at the World Poker Tour (WPT) Marrakech €3,000 buy-in No-Limit Hold’em main event in November. Other players to cash at the PCA side event included New Jersey’s North American Poker Tour (NAPT) Venetian champion from last February, Tom Marchese – which earned him $827,000 – as well as 2009 EPT Warsaw winner Christophe Benzimra, of France, Russian star Dmitry Vitkind and the PokerStars.it-sponsored Italian Poker Tour (IPT) Player of the Year Mustapha Kanit.